A strange and twisting story, east Dallas’ Bianchi House was approved for Landmark Designation yesterday in a unanimous decision. It was originally scheduled for inclusion in the adjacent Peaks Suburban Historic District many years ago, but was carved out by the owners at the time. 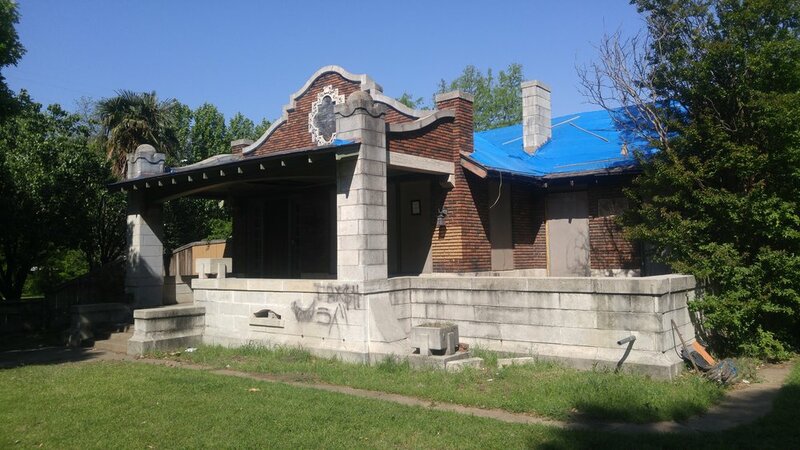 Instead, they applied successfully to list the house individually in the National Register of Historic Places, a step that confirmed the house’s historic importance but did not include any protections against demolition or inappropriate modifications. Nevertheless, the owners executed a thorough and loving restoration in which they lived for a number of years. Following a fire in 2013, however, the story took an odd turn, well documented in these articles by Robert Wilonsky of the Dallas Morning News. Monday, however, was an important step on the way back. In addition to the recognition and architectural safeguards that come with historic designation, the Landmark Commission also approved an initial Certificate of Appropriateness that allows work to begin to repair the burned roof and thus to stop the water infiltration that continues to threaten the elaborate wood and plaster. Norman Alston, AIA prepared the historic designation report, with considerable assistance from Dr. Evelyn Montgomery and other members of the Dallas Landmark Commission’s Designation Committee, as well as City Preservation Planner Liz Casso. Richard Drummond Davis is the design architect for the restoration and a planned addition, with consultation on preservation concerns by Norman Alston, AIA.